I am happy to announce a new showing of my work at Mark Gruber Gallery in New Paltz. 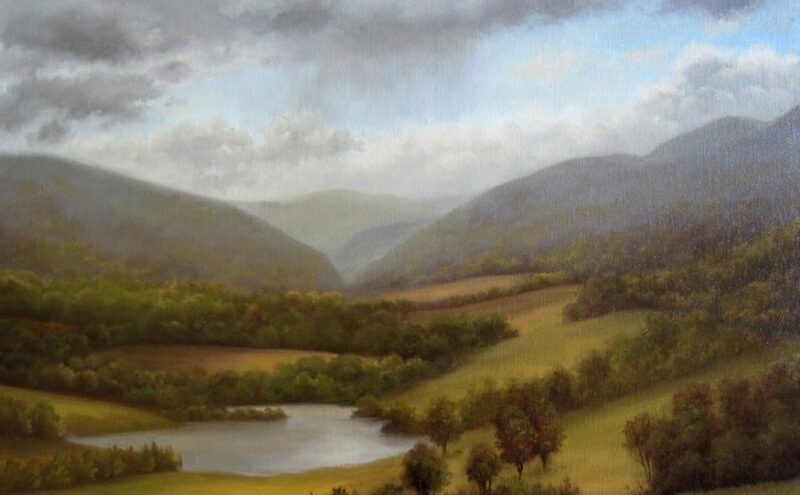 Running from May 12 through June 30, 2018, the show features my new English paintings along with favorite views in the Shawangunks and along the Hudson River. This is a two person show, also featuring the exquisite pastels of my artist friend Marlene Wiedenbaum. 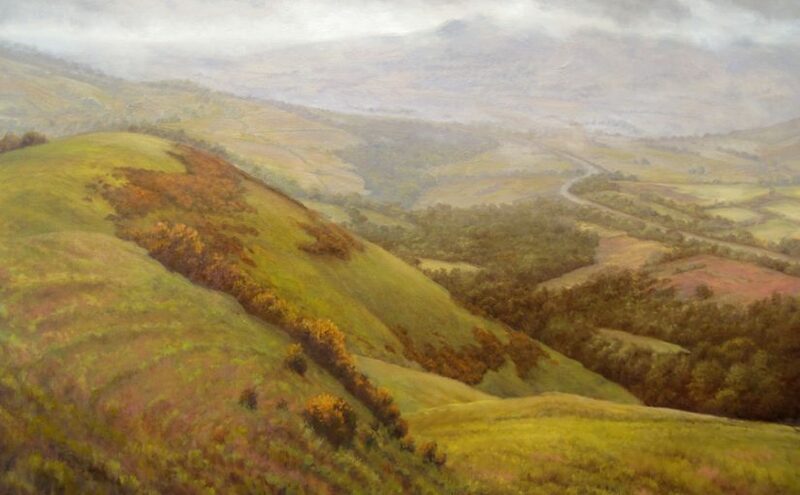 Join us for an opening reception on Saturday, May 12 from 5:00-7:00 PM at the gallery. These past few months have been filled with new revelations and reflection, as well as a great deal of painting time. Seeing an exhibit of Thomas Cole paintings at The Metropolitan Museum of Art has confirmed that Cole was deeply influenced by his Englishness, and by the English Romantics of the time, Constable and Turner. 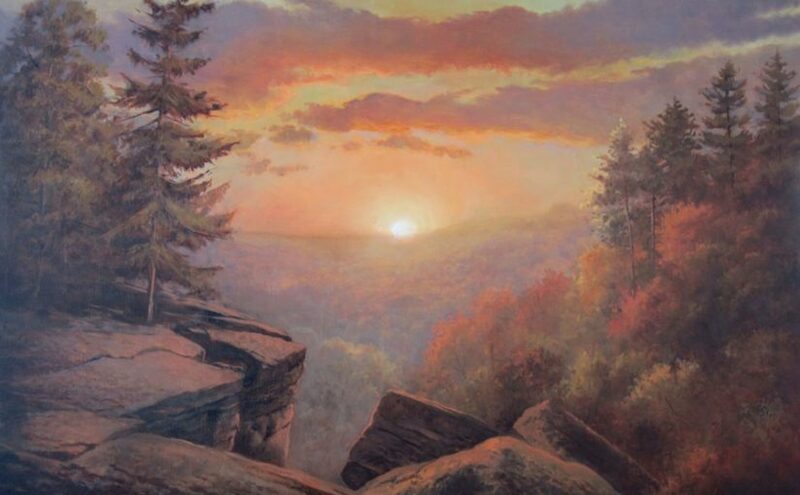 While I have always held a great appreciation for the Hudson River School, native to my own Hudson Valley, I am also under the spell of England, land of my ancestors. 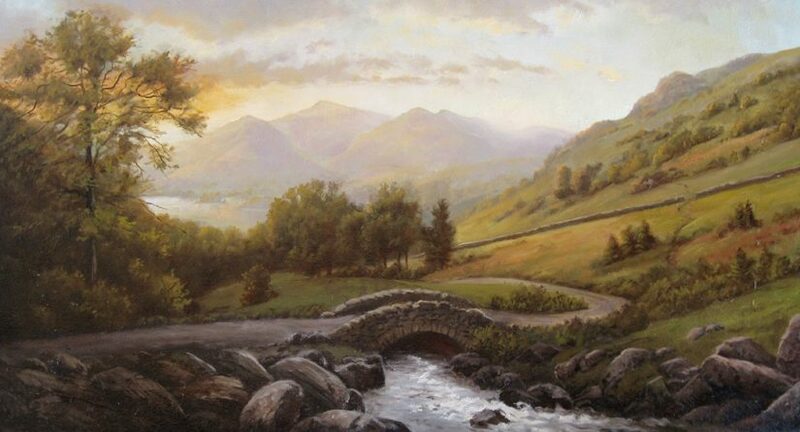 With this new series of English landscapes, I bring my romantic impulses full circle. 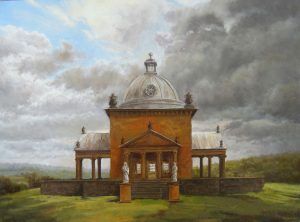 “Wordsworth Country” (above) has all the poetic feel of the lush hills of England, while “Temple Of The Four Winds” (inset) explores British formal gardens and their follies. In a little departure from my usual work, I’ve investigated the nostalgic world of memory. Inspired by faded photographs collected while preparing the family homestead for sale, the works portray family members pursuing hobbies, on visits, preparing food, and simply growing up. The mid-twentieth century world, with its stricter gender roles, bottle fed babies, and fin-backed cars has all but vanished, but live in a shared cultural memory. 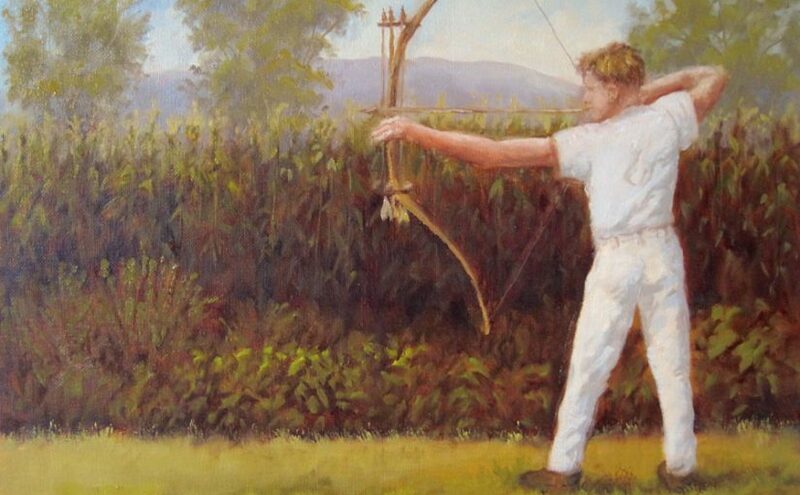 “The Archer”, seen above, depicts my older brother at practice in the backyard, around 1963. See the show through October 31 at The Bakery in New Paltz. An opening reception will be held Thursday October 12, from 5-7 PM. 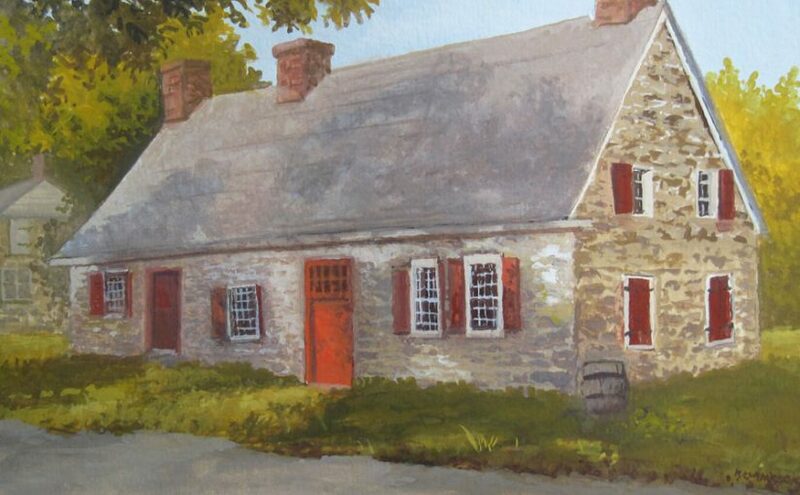 Saturday, August 12 is the annual Artists On Huguenot Street event here in New Paltz. Please plan on dropping by during the day to see me working on a plein air painting before your eyes. I will also be hosting an Open Studio during the day, a rare opportunity to see paintings, sketches and prints you may not have seen featured in galleries. “On Huguenot Street”, an 8 x10 piece (right) was completed earlier this week. 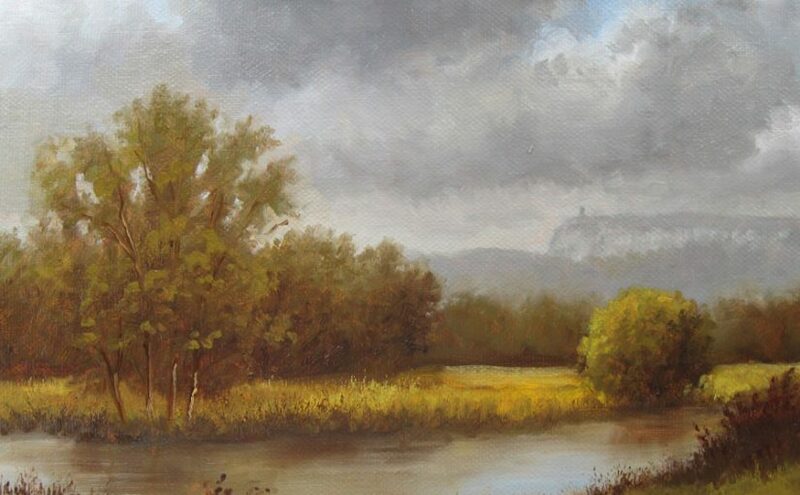 The above piece, “Summer Along The Oxbow”, is also 8 x 10 and depicts a view from a nature sanctuary here on the street. The event is held from 10-4, rain or shine. Have you ever wondered how a simple snapshot, taken on a hike with a friend many years ago, becomes a full-scale romantic painting? The photo seen here became the inspiration for “A Rose Colored Glow”, above. Join me on Saturday, May 6th, when I will demonstrate my painting technique in a special event at the Mark Gruber Gallery in New Paltz, beginning at 5PM. This is a rare opportunity to see an artist at work. 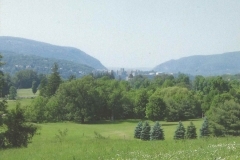 The gallery is located at 17 New Paltz Plaza, New Paltz, NY and can be reached at (845) 255-1241 for more information. Kevin is proud to announce that he will be featured at The Mark Gruber Gallery in New Paltz, NY in a two artist show. The show runs from April 8 through May 20, 2017. An opening reception will be held Saturday, April 8 at the gallery from 5-7 PM. 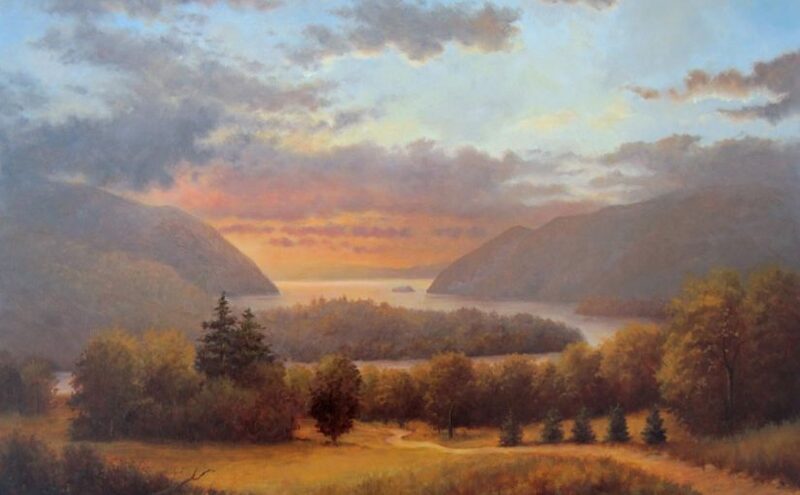 Kevin will have more than twenty new paintings on display, showing his signature romantic skies and Hudson Valley scenery. A prime example is “In Wild Country”, seen above. Winter is the season for quiet reflection and rejuvenation. Even as it comes to an end, there is the desire for one more day of hot tea, an engaging read, and time to collect one’s thoughts. Kevin often finds winter to be his most creative time of the year. 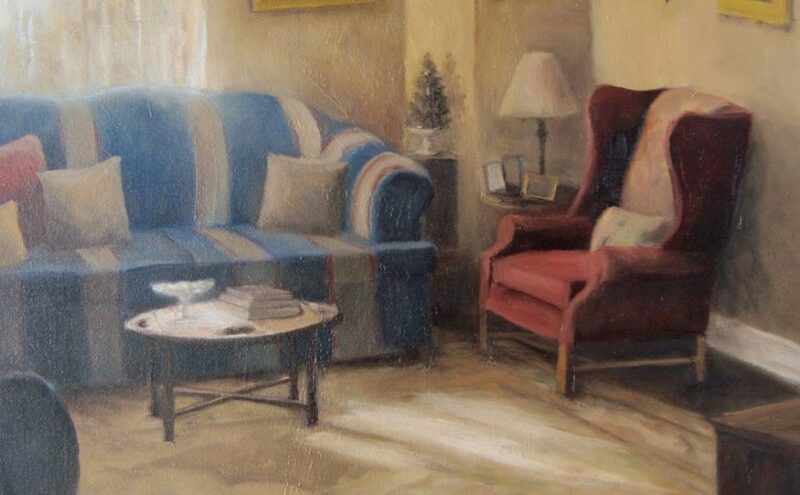 Here is a detail of his recent painting, “The Artist’s Parlor”, suggesting the cozy introspection of the season. This winter you can see Kevin’s paintings adorning the sets of two premium cable television shows. Look for them in the first season finale of HBO’s Divorce, starring Sarah Jessica Parker and Thomas Haden Church. In addition, two of Kevin’s paintings (including “Rolling Hills Of Home”, above) adorn the dining room of character Chuck Rhoades, Sr on season two of Showtime’s Billions, starring Paul Giamatti and Damian Lewis. Happy viewing! It’s gouache season! 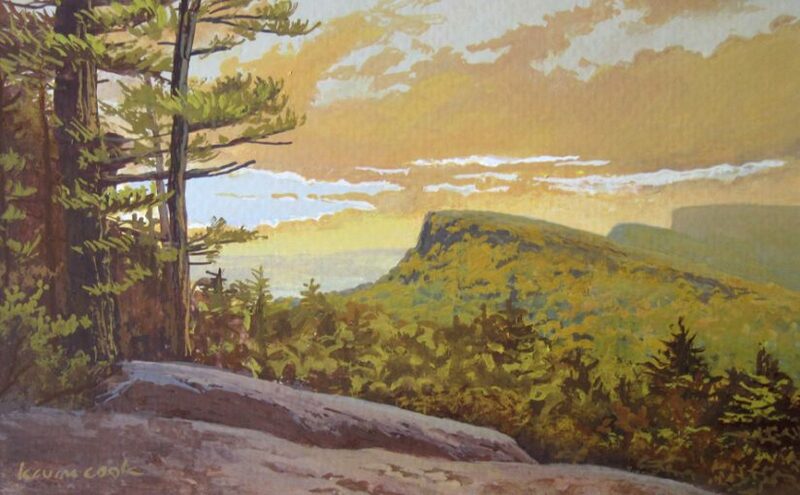 I have fourteen new gouache paintings on display at Mohonk Mountain House through the month of September. 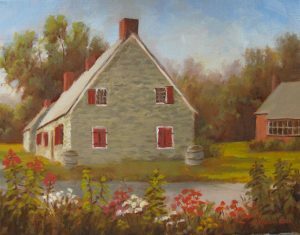 This annual exhibit is in the rustic Barn Museum and features views of the Shawangunks. Gouache paint is an opaque form of watercolor used by designers and illustrators. These paintings are inspired by early twentieth century children’s book illustrations and by antique hand colored postcards. If you’re going to be spending a day at Mohonk, be sure and stop by! Join me on Huguenot Street in New Paltz for the Fourth Annual Artists On Huguenot Street event, being held on Saturday, August 13, 2016 from 10AM-4PM. The event is held rain or shine. I will be hosting an Open Studio featuring many paintings, plein air sketches, prints and more. You can also visit while I create a new painting before your eyes. Hope to see you there.